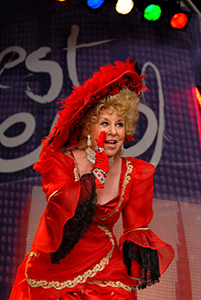 Jan Hunt's versatility has given her the opportunity to perform in pantomime, West End musicals, music hall, cabaret, film, radio and TV, where she was affectionately known for many years as the Crackerjack Girl. Her long association with the Players' Theatre led to many appearances on The Good Old Days and she received great acclaim as the lead role in The Life Story of Marie Lloyd. As a producer with Classic Comedy Productions, Jan has recently co-produced number one UK tours of Dinnerladies, Keeping Up Appearances, Rising Damp and most recently Birds of a Feather.